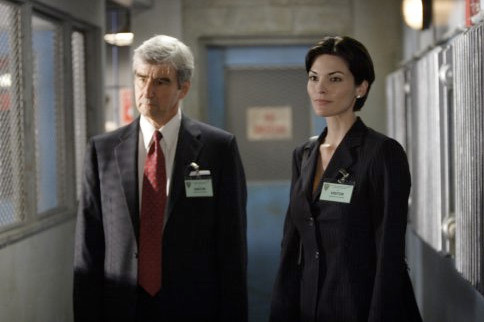 This news hitting the wires today NBC has announced it will cancel “Law & Order” after 20 years of episodes. The long-running drama will finally come to end — its termination possibly having to do with “sagging ratings and creative fatigue,” writes the DailyNews. On Thursday there were murmurs the show might be on its way out, but NBC did not confirm anything. Reuters reports the show’s audience had dropped to an average 7.3 million viewers per episode vs. 18 million in 2002. “Law & Order” stars Anthony Anderson, Alana De La Garza, Linus Roache, S. Epatha Merkerson, Jeremy Sisto, and Sam Waterston. Spinoffs of the show — “Law & Order: Special Victims Unit” and “Law & Order: Criminal Intent” will continue production. “Law & Order” has tied “Gunsmoke” as the longest running prime-time drama. Both my husband and I are upset about the cancelation. Come on Subway, you saved Chuck (which is a joke)! Let’s save Law and Order too!! This is a quality show, with great actors. Especially New York actors. At least let it have one more year! Being a FAN of the show since it first aired. I can not understand why after so long that it has been cancelled, if it was for the ratings, then this to is something else since they’re been shows that proves to be useless running on god knows what with or without ratings, and still they are around. Knowing to well this show was thought provoking emotional drama that deserved more then what it deserve. NBC is awful now. The people running it aren’t trying to save the network, they are just trying to save the network money. They will probably replace Law & Order with more cheap to produce reality crap. The only reason they even tried Leno at 10 is even with his inflated salary it was a lot cheaper to produce than an actual written, well thought out and produced drama. So now we will just end up with the next American Idol, Dancing with the Stars. Probably Dancing with the American Idol has-beens. Thanks NBC for making another stupid move. I wonder if you will ever have executives again that know what they are doing. Law And Order ratings went down because of its time slot, and on Mondays it hasn’t had a good slot for a while just like CI. Thank NBC for all of this with the Jay Leno show everyone. Thanks to Jim I now know why I couldn’t find the new episodes of Law & Order. NBC really has screwed up. At its all-time low with 17 million + viewers, it’s definitely one of the best shows on any of the big 3. NBC should let it play out a little more and give casual TV watchers/fans time to find it!! Boy, first it was Leno and now Law & Order…sure seems like NBC really knows how to fritz things up, doesn’t it. Well, my opinion of NBC just went down a few notches as I have been (and continue to be) a big fan of Law & Order…and so is my better half. Let’s hope NBC wakes up from thier fog and changes their minds. The ratings dropped because NBC moved it to a 9PM time slot to accommodate the Jay Leno Show that was on at 10 pm until it too got cancelled. Then they attempted to revive the ratings by moving it back to the 10 PM time slot. A little too late to save it now. NBC messed up royally when they moved all of their 10 pm shows to 9 pm and cancelled a bunch of other shows. I’m disgusted with NBC sometimes.